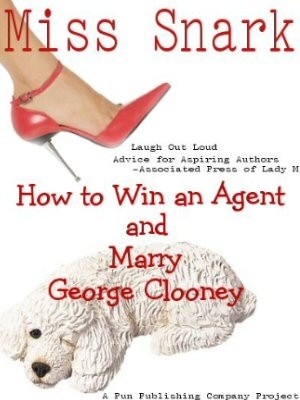 Miss Snark, the literary agent: Pass the Prologue! I see that often (if not always) agents request the first ten pages (or some other equally manageable quantity) of a novel to be included with a query -- and many (if not most) are adamant about including specifically those pages. Now, I am a firm believer in adhering to the guideline of any potential reader (and yes, I always include SASE's, thank you very much), but my question is this: what if the first ten pages are not quite representative of the writing as a whole? Specifically, my novel has a 12 page prologue that, while well-written (one hopes), uses a different voice and style than the remaining 350 or so pages. I fear that including only the first 10 pages will give an inaccurate impression of the novel itself. Would it be appropriate to include the first 10 pages of chapter 1 (with a note explaining why), rather than the prologue pages? If you have a prologue, DO NOT SEND IT as your first ten pages. Send the first ten of chapter one. You don't have to explain it either. IF the agent wants to read the novel and asks for it, THEN you mention in your catchy and enticing cover letter that you have a prologue. I hate prologues. Not quite as much as I hate synopses, but close. What if the first chapter doesn't have a big enough "hook" without the prologue? I have the same problem--my book is written from two completely different characters' POV, and the first page is only one of the characters. So I never know, do I mention this when I send it? Do I send five pages of one and the first five pages of the other? They inspire in me the same loathing reaction I get at the sight of cockroaches. I've seen writers put them in under the misapprehension that it gives validation to a work. Or it's included "just because." A good prologue would is the opening scene in Citizen Kane with the dying man whispering "Rosebud." That one works. Unless a writer has that level of significance to drive their plot, then amputate the dang thing. With a dull axe. An epilogue to wind up a loose end or two I don't mind, but unless the prologue truly is lifeblood to a story, I look upon it as just another roach: everywhere and nearly impossible to kill. Skarlinged is an adjective that comes from two root words. The first is *skar*, which means to be beat into the ground by bad luck, repeated passes by agents, and the disaffection of the world at large for the things you love (i.e your writing or art). The second root, *ling*, comes from the root work 'lingomanios' which means to be driven by insanty to rise above the ashes like the phoenix. It is a common condition among writers and artists of all types. The fact that this writer says her heart is newly skarlinged is confusing but we don't have to understand everything. This suggests that the next Crapometer event focus on prologues. Miss Snark, have you seen this web site? It's a collection of lit. agents e-mail addresses, but it's also the correspondences the site owner has had with different agencies. I'm not sure if he ever got an agent, and if he did, it's by sheer good luck. I pity the agent who ever has to represent him! oh ya Elektra, G. Jones has been around forever. Hollywood execs are in a dither trying to get his site down cause they are "inundated" with email. (Miss Snark just laughs). His book Ginny Good DID get published. I've met his publisher, who appears sane despite this. Gerard Jones is actually a hoot. I like him. I don't want to ever be his agent, but I like him. Aww... the poor maligned prologue. I think it has its place, if done well it can set up the whole story, whet the appetite even - it's like a nice appetizer. Having said that, is there a means for determining what would be better as a prologue or better as a first chapter? I've used a prologue in my ms because the events take place twelve years before the main story begins, but the events are quite pertinent to the rest of the plot. Should I just make my prologue "Chapter 1" to avoid the wrath of a prologue-hating agent?